Mother's day is two weeks away.. So if you're in need of some recommendations, here they come! or maybe pass along these ideas to a friend. mugs are a necessary part of any drinkware collection. 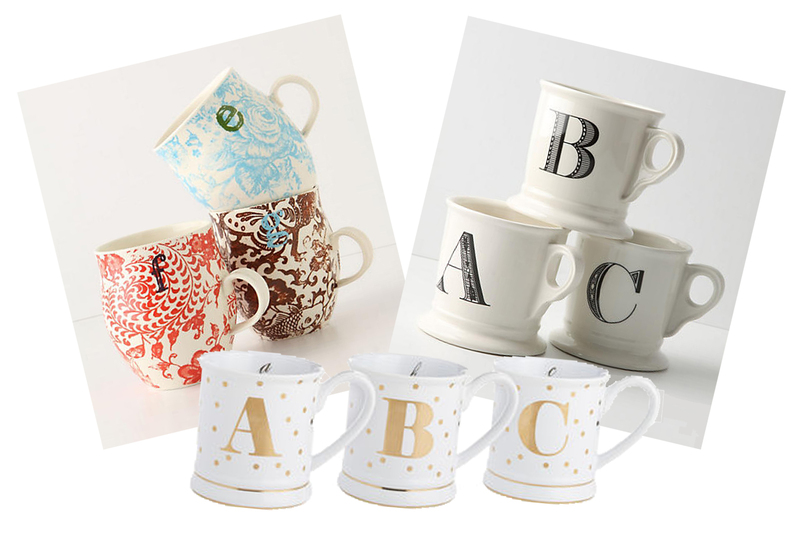 If your mother or a mother you know has to start their day with a hot beverage, a mug with their first initial or the initial "M" for "mom" is a great gift idea. You can give her one of the cult favorites from Anthropologie or one of these adorable white and gold mugs from Pier 1. Every morning she'll see it and think of you, and how much you appreciate her. A classic piece of jewelry has always been a beautiful way to show mom how much you appreciate her. I love the locket necklace pictured above from Kate Spade. The initial carved into it makes it even more personal. Put a special photograph inside and every time mom wears it she'll remember your love. 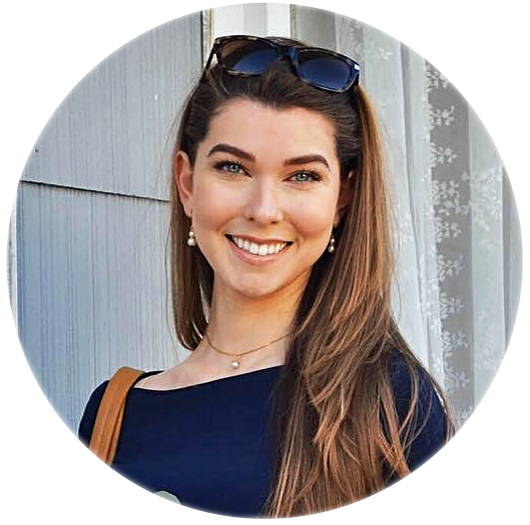 Knots have long been used as a symbol of love, friendship, and affection, making this Sailor's Knot necklace by Kate Spade as well a perfect gift for your mother. Both these necklaces are elegant and dainty, so they can be worn with any and basically every outfit she wears. Lastly is of course one of our Hampton Ivy bracelets. Pearls have been given as gifts for centuries now. They symbolize many things, but their symbolism of purity and elegance are what make them a perfect gift in my opinion. 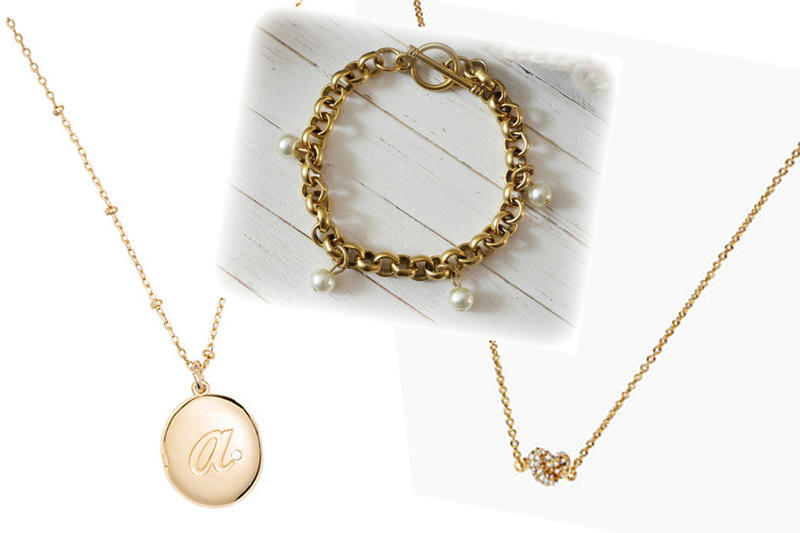 This bracelet has glass pearls attached to a gold chain link. 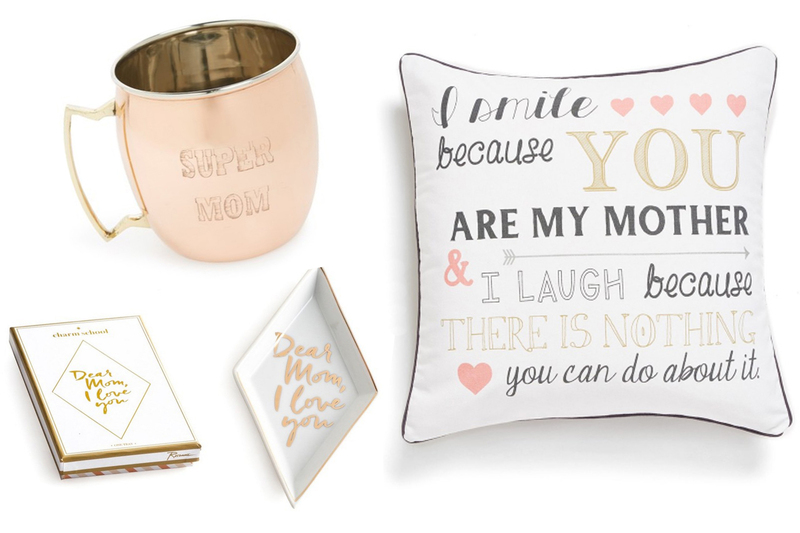 Little unique pieces to go around the house are also fantastic gifts for mom. Moscow Mules were a huge hit last year, and I expect they will be just as loved this year. I found this copper mug on Nordstrom and fell in love! It says "Super Mom" on it and looks like the perfect piece for mom to put at the front of her cupboard. Anytime she has friends over for drinks, she can show off what a good gift giver you are, and how "super" she is! Who doesn't love pillows? I found this pillow on Nordstrom as well and had a good laugh, because it is completely true. Being a mom can be rough; as kids we're not easy to deal with- let's be honest! 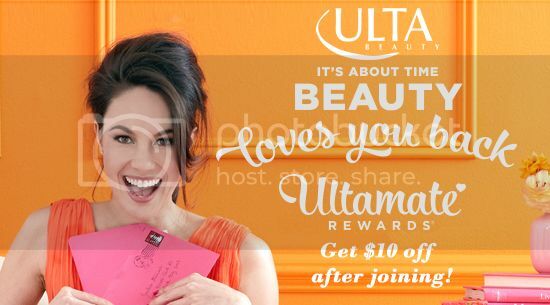 So what better way to show mom you love her than to tease her and laugh about it? It says, "I smile because you are my mother, & I laugh because there is nothing you can do about it." Perfect. Maybe she doesn't like Moscow Mules or doesn't need anymore pillows. No problem! A little trinket tray is a perfect gift. Choose one that says something sweet like "Dear Mom, I Love You" and it's even better. Every time she looks at her jewels, she'll remember the one most valuable to her.. you. And how much you value her too. Helpful pieces for around the house. Don't worry, I'm not talking about cleaning supplies here. I'm talking about pieces that help her when she's cooking or baking, help her decorate, or help her relax and be happy. My mom and I absolutely adore cooking, and especially love baking. It can be difficult in a tinier kitchen, but even in a big kitchen, to keep your cookbook out of the way and still see it for instructions. A cookbook stand is extremely helpful. It keeps the cookbook open on the page you need, and upright so you can bounce between what you're doing to cook or bake and read. This one is especially perfect with "Mom's Kitchen" carved into it. Coloring isn't just for kids anymore. Coloring books are all the rage. I've given them as gifts to people I know who would love them, and they've been a hit every time. They relax you and let you focus on one thing, which can be used for meditation or release. Or it can be just a fun and entertaining pass time that gets your creative juices flowing. Mom will love it! Comfortable clothing is a must! Relaxation is a must, and mom deserves to be comfortable and feel cute at the same time. I absolutely love this sweatshirt from J. Crew. It may not say "Best Mom" or one of those Mother's Day phrases, but I think it relates to her perfectly. Le Capitaine, the captain, is in charge of what goes on in their vessel. They make sure everything runs smoothly and they're responsible for their crew. 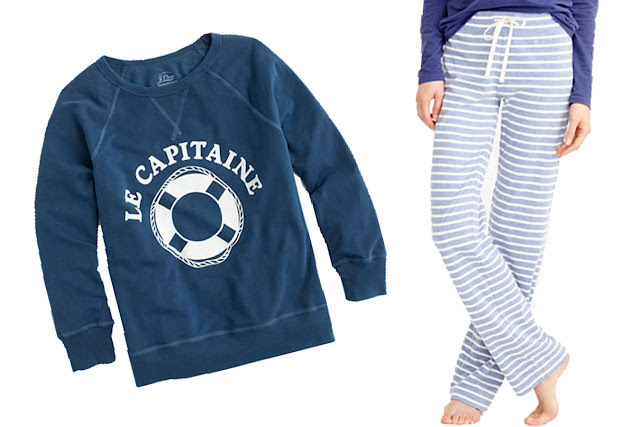 Maybe it's cheesy, but us nautical lovers can sure appreciate it! A pair of sweatpants are also necessary. I thought this pair, also from J. Crew, was absolutely beautiful. 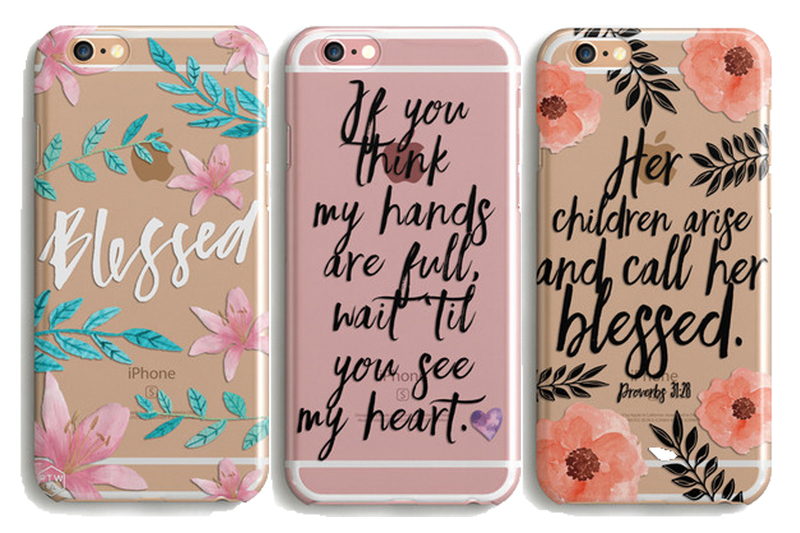 Last but not least... phone cases. I've long been obsessed with the phone cases from Prone to Wander. They sell TPU and wood phone cases, but my favorite are the TPU cases. 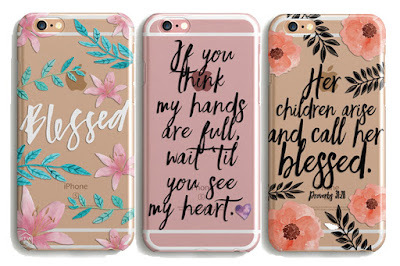 Why not grab mom a phone case with a beautiful quote to show her how much you appreciate and love her, or one that will make her feel blessed every time she looks at it. 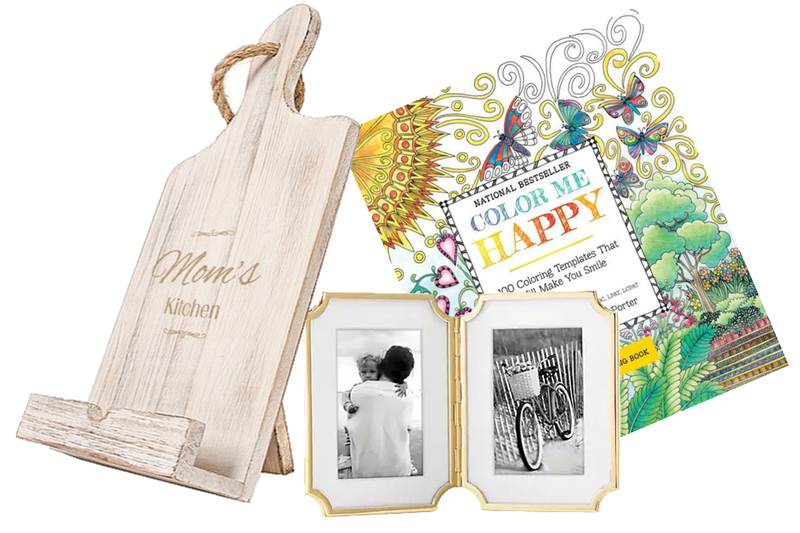 These are three of my favorites for a mother's day specific gift. "If you think my hands are full, wait 'til you see my heart." "Her children arise and call her blessed." I hope you all found my recommendations and ideas helpful, and if you give mom one of these gifts I hope she absolutely loves it!